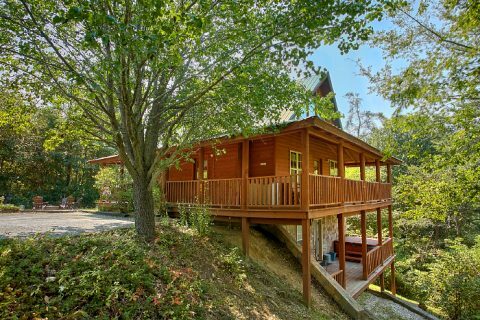 With a beautiful view, secluded setting, a fire pit, and great amenities like a theater room, hot tub, and a game room, this cabin might be exactly what you're looking for! 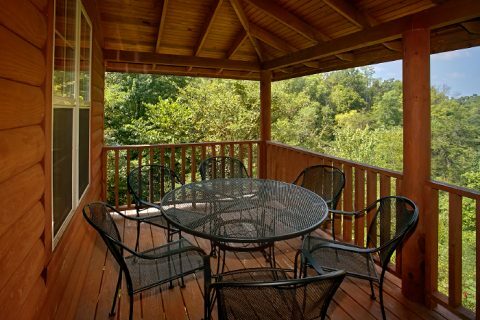 "2 Tranquil 4 Words" is a peaceful cabin rental in Sevierville, TN with 2 bedrooms and plenty of room for up to 10 guests. 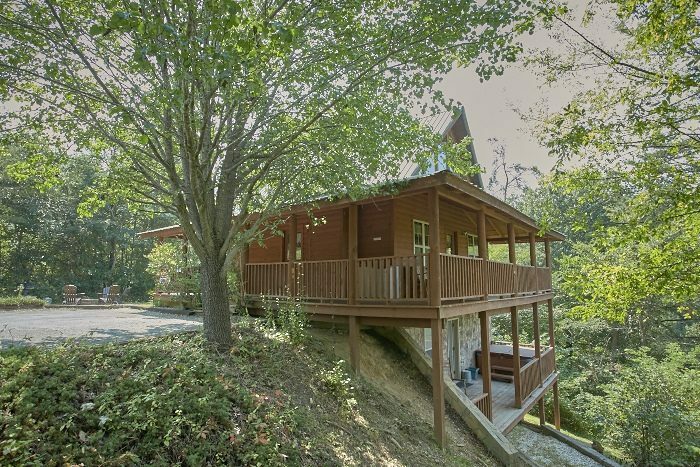 While this rental is tucked away in the mountains, you'll find that your cabin is less than 7 miles away from Dollywood and the Pigeon Forge Parkway! As a result, you can tailor your vacation to be exactly the way you want it to be, whether you're planning an action-packed getaway or a restful retreat. 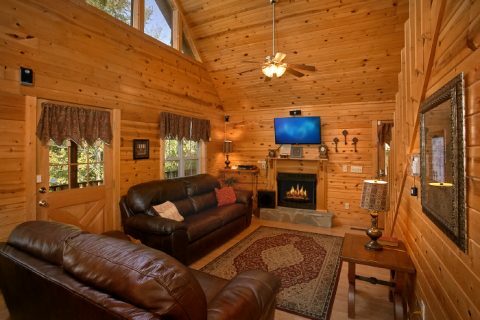 As soon as you step into the spacious living area of your two-bedroom cabin rental, you'll fall in love with inviting features like the gas log fireplace, new living room furniture, and large picture windows to allow ample natural light to fill your cabin. 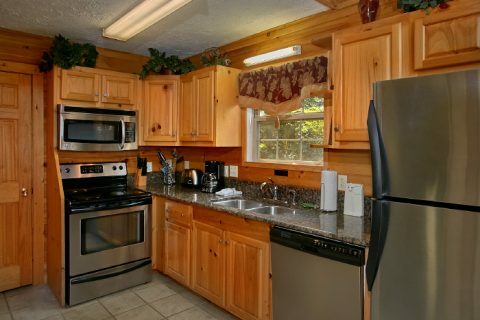 Nearby, your cabin's complete kitchen boasts modern appliances and an 8-person dining table. Above the fireplace mantel, you'll enjoy the 42" LED HD television with a DVD player and surround sound for watching the big game. 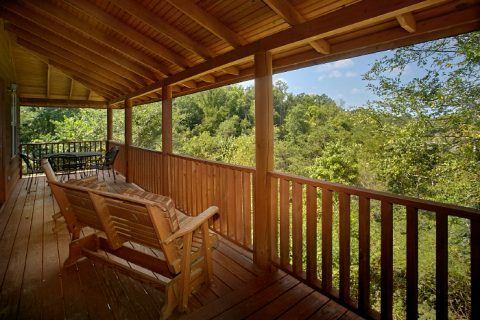 From the main level, you can step outside onto the wrap-around, covered deck with rocking chairs, a porch table, and a glider swing that's perfect for sitting back while you enjoy the great view. 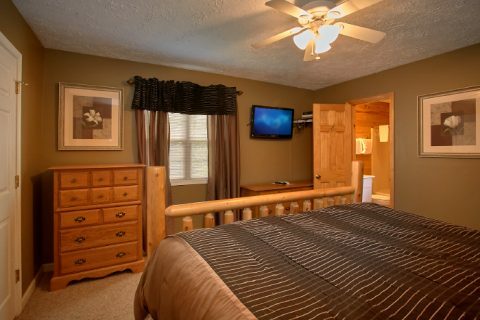 This floor of the cabin is also home to the master suite with a king-size, log-frame bed, 32" LCD HD TV, and a DVD player. This room shares a full bath with the living room area. For additional guests, the lower level offers a leather sleeper sofa. Two comfortable futons in the upstairs loft allow your cabin to comfortably sleep up to 10 guests. 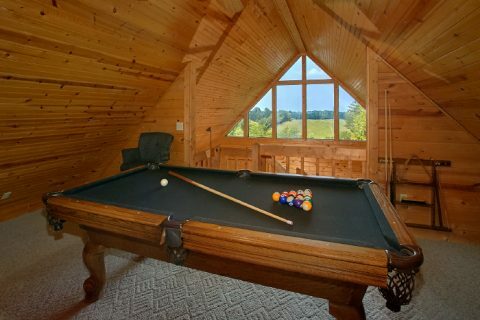 The upstairs loft is home to the game room with a pool table and board games. Large, picture windows make this room a great place to perfect your pool shot with a lovely mountain view for your backdrop. 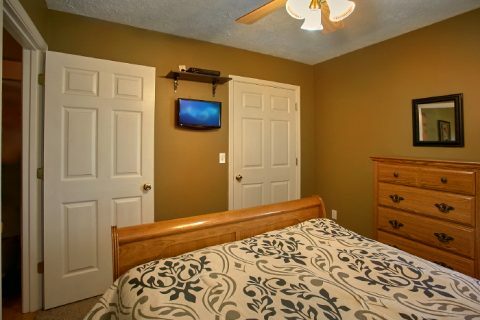 Downstairs, you'll find the queen-size bedroom with a private television and access to a bathroom that it shares with the theater room. 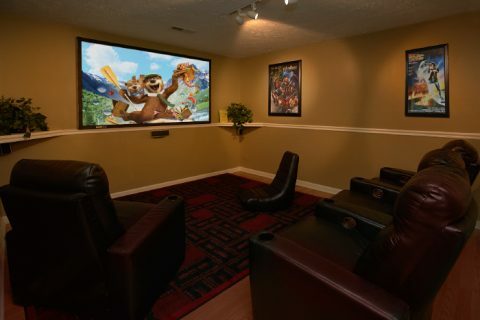 With an 8' screen, theater seats, a DVD player, and surround sound, this home theater system takes your favorite shows and movies to the next level. 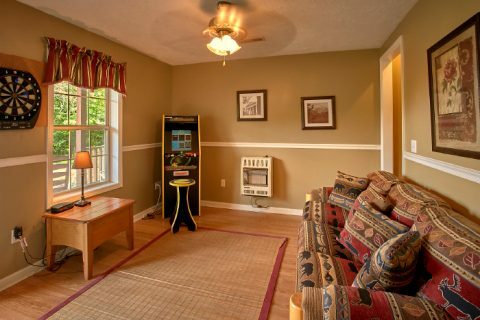 In a sitting area on this level, you'll find an arcade game and a dart board. 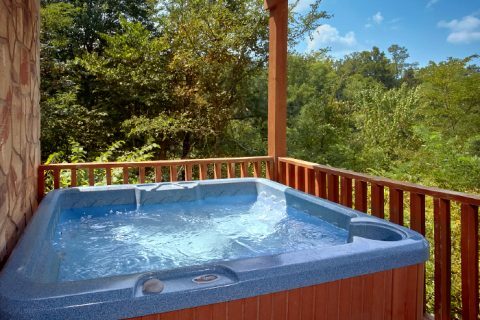 This level also has access to the lower deck with a hot tub that's perfect for relaxation surrounded by the beauty of nature. 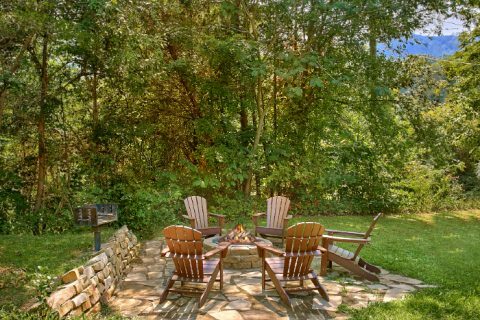 For a great evening activity, you can step off the deck to a stone patio complete with a fire pit and chairs. 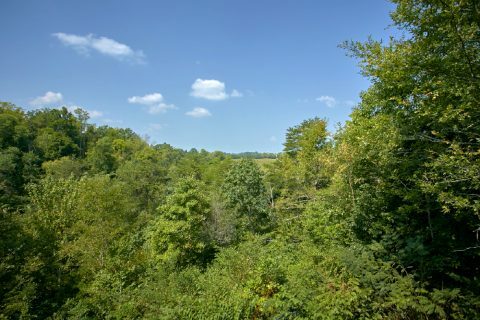 This rental also a 4 acre, forested property, so you can enjoy the sights and sounds of nature during your stay. In addition to rustic amenities like the fire-pit, this cabin offers modern features like WiFi Internet and a washer/dryer. 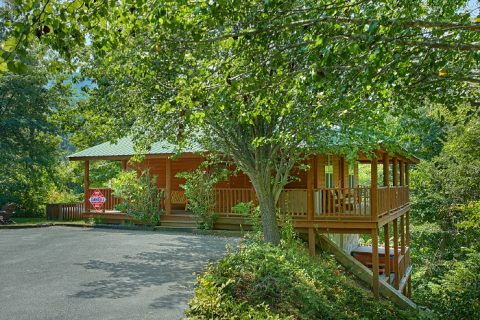 Book "2 Tranquil 4 Words" with Cabins USA online today to save 15% on your secluded Sevierville cabin that's only minutes from all the action in the Smoky Mountains! 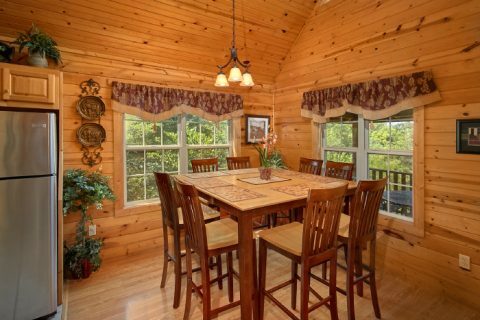 Bring your family and friends on a trip to a cabin with all the comforts of home and more!